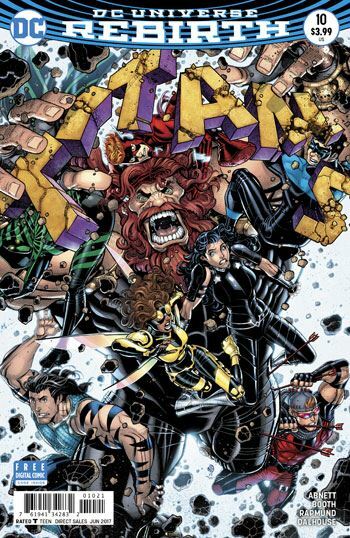 Titans #10 brings the Bumblebee/Fearsome Five storyline to a conclusion. On the whole, it follows a standard format for these kinds of tales, but the ending is strong, it fulfills its function, and the art is dynamic and engaging. The Titans themselves get to face off against the Fearsome Five in a series of one on one combats. Of course, the Titans do not fare nearly as well as they might. If they did, there would be little reason to have Karen Duncan come in to save the day. I was very happy to see that shrinking has been added to Bumblebee’s repertoire of powers. 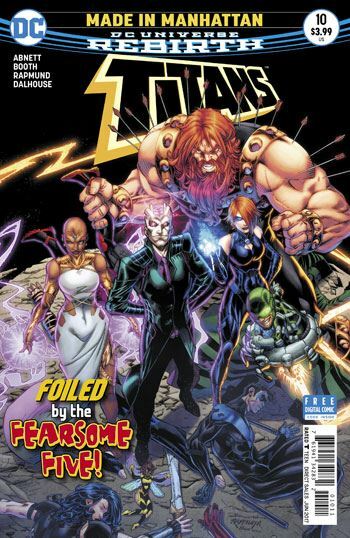 In the miniseries 52 Bumblebee had been shrunk as a result of exposure to the reality warping events in Infinite Crisis, and her miniscule state was retained in the brief Doom Patrol run which followed. In that book, Karen was trapped in her tiny size. In this issue, Bumblebee is able to shrink, but also to regain her normal size. The story also makes it clear that there is more to her than has yet been revealed. And Psimon’s parting “gift” to her ensures that it will take a while to learn Karen’s secrets. The only other character to really get much play in the issue is, appropriately, her husband Mal. He does seem to have a but of a problem with “borrowing” other heroes’ gear. OK, maybe I overstated that. He has done it twice. In this issue, and waaay back in the 70s revival, when he raided Speedy’s locker and found the Guardian costume. Overall, I was quite pleased with this story arc. Bumblebee always had potential, and I am glad to see it finally being put to use. I also liked the tease for the next issue. It's not one of the greatest Titans tales ever told, but it achieved its goals admirably.